Domen123 wrote: How common is to find info in any British / American source, that for example - "Germans reached Warsaw in 6 days", "Polish army was using 19th century tactics", "Germans didn't have Panzer Corps in Poland, Panzer divisions fought separately", "on 28.09.1939 Poland signed capitulation", "French were retreating / surrendering almost without resistance, only the British Expeditionary Corps fought bravely and succeeded near Dunkirk and this was the first turning point of WW2", etc. These examples are not my inventions. For example the info that in Poland Germans didn't operate with armoured-motorized Corps and didn't have any, but Panzer divisions fought separately (while in fact they had plenty of armoured-motorized Corps - XIX., XVI., XV., XIV., XXII., some of them cooperated with each other, for example XVI., XV. and XIV. or XIX. and XXII.) can be found in "The Blitzkrieg Legend" on page 18. Info that on 28.09.1939 Poland signed capitulation is also common. "[...] during the Polish campaign German armor was not yet employed independently on operational level either at the corps or army echelons. Instead the Panzer formations on the tactical level usually fought in a divisional framework." - both the claim that in Poland Germans didn't have armoured corps and the claim that Panzer division is a formation designed to work on tactical level (even single Panzer division is a formation clearly designed to complete operational tasks) are false. "[Polish army] was old-fashioned in terms of equipment and training" - so I am asking, in what ways was the Polish army more old-fashioned in terms of equipment and training than - for example - French or Czechoslovakian army of the same time, which is considered (but I am not sure why) as modern by Western historians. "[...] anachronistic tragedy that Guderian reported of the troopers of the Polish Pomorska Cavalry Brigade attacking German Panzers with their sabers". Thus I think that such books like Richard's book are very necessary (even if I don't agree with some aspects of his book ). What is even more necessary is translating Polish works / sources on the campaign to English, as Richard noticed it is shameful that Poland issued hardly any books in English on this topic. I wish You a lot of further fruitful work, Richard! My particular interest is early-war aviation....and the Polish air campaign is very similarly badly served by English sources. It is everso slghtly better off....because at least there are just SO many books dealing with the aircraft at least...but overviews of the campiagn as a whole - very VERY few, and almost NO campaign memoirs translated into English. I know why Western historians claim that Czechoslovakian army was more modern than the Polish army. The only reason is the fact that Polish army opposed to the two best, biggest and strongest armies of that time (Wehrmacht + the Red Army) and lost after hard fight, while Czechoslovaks never opposed and thus never lost. Those who claim that Czechoslovakia was able to repulse the German invasion claim this only because the German invasion of Czechoslovakia never happened. Exactly the same was claimed about Poland in 1939 (even the strength of Polish army was exaggerated by Western propaganda), and later about French army in 1940. Everybody believed or wanted to believe that Poland (and later France) would be able to repulse enemy invasions. But the fact is that Czechoslovakia knew as much about Blitzkrieg as Poland (so almost nothing) and was not prepared to repulse Blitzkrieg at all, even in 1938 when German army was not so strong as one year later. Moreover - as you can see Polish army was considered as relatively modern back then. Today some people claim that it was obsolete only because it lost the war against Nazi Germany and the USSR - this is the only reason. And Czechoslovakian army (which was just a little bit more modern than Polish) is still claimed modern only because it never lost such a war (as it never took place). People are blind and can't see the real reasons why Poland and later France lost their struggles. Germany, Russia, France, Czechoslovakia and Poland - these 5 countries had the best ground armies in Europe in 1938, all other countries were far behind them. It is sometimes claimed that Czechoslovakian fortifications were extremely powerful. Certainly it had favourable position in this case - its borders were much shorter than borders of Poland, thus easier to fortify. But if it comes to the quality of fortifications itself, according to the German study of Polish fortifications titled: "Denkschrift uber die polnische Landesbefestigung", published by OKH in 1940, Polish concrete fortifications were much better (much more resistant to fire of heavy artillery, Anti-Tank artillery and bombs) than Czechoslovakian fortifications. Unfortunately Polish fortifications were also easier to be outflanked (e.g. Mlawa). Of course the above quoted British propaganda video is exaggerating the size of Polish army. Polish army before the common war mobilization, on 01.06.1939 had got 439,738 soldiers (on 01.01.1939 it was much weaker - only 256,378 soldiers) and after a dozen or so days of war mobilization it was to be increased to up to 1,350,000 - unfortunately this number was never achieved as Poles didn't manage to finish their mobilization before 01.09.1939 and later it was hard to achieve. "[Polish army] was old-fashioned in terms of equipment and training"
The French in 1940 were also so blind. When Polish soldiers who retreated from Poland came to France, French commanders wanted to teach them the basic rules and tactics of infantry combat (because they thought that Poles lost because of lack of such knowledge / training). They didn't even want to listen to Polish conclusions from the campaign, some French generals called the Polish campaign an "expedition" and were convinced that France was going to easily deal with Hitler. Halder yet on 27.09.1939 wrote in his diaries, that "The French will not have such a combat value like the Poles", but Germans were not convinced that France is possible to be defeated until their plan turned out to be succeswful (on the other hand, before Polenfeldzug they predicted that Poland would fall faster than it really happened). Richard Hargreaves wrote: Few people, save the German military, expected such a rapid defeat of Poland – certainly not the Poles themselves. Most Poles certainly didn't expect a rapid defeat (or didn't want to expect). But there were a few reasonable persons. For example colonel Stefan Mossor, author of the book "Sztuka wojenna w warunkach nowoczesnej wojny" ("The art of war in conditions of the modern warfare"), who yet in March of 1939 estimated, that Poland was going to be defeated after no more than 14 days of war against Germany alone (so as practice showed, he even underestimated its defensive capabilities). It should be noticed that in late August of 1939 Polish situation was much worse than in March of 1939 (Czechoslovakia was occupied and Ribbentrop-Molotov signed). Col. Stefan Mossor was the commander of 6. Horse Rifle Rgt. (Kresowa Cav. Brig.) during the campaign, his unit was encircled and destroyed on 11.09.1939. Also gen. Tadeusz Kutrzeba was pesimistic - he estimated that Poland could resist - against Germany alone - for 3 weeks (so he was closer to the truth than Mossor, but even he underestimated Polish defensive capabilities, considering that in fact it resisted longer and that in fact on 17.09.1939 it was invaded also by the USSR). General Kutrzeba saw the only chance of stopping the Germans in a large-scale counterattack (that's why he was later so mad when he was not allowed to start it). Kutrzeba was also an outstanding war theoretician. He was the author - together with Mossor - of the "Study of strategic plan of Poland against Germany" (they worked on it since 14.11.1937 until 10.01.1938), but they were not among the authors of "Plan Zachod" itself. Mossor's "Sztuka [...]" was published in 1938 too. To summ up - all Polish war theoreticians (only 2 of them) who researched this topic (Polish capabilities of resisting Germany), knew that Poland stood no chance. But nobody listened to them. Mossor - after his statement about 14 days - was even expelled from GISZ (General Inspectorate of Armed Forces) for defeatism. 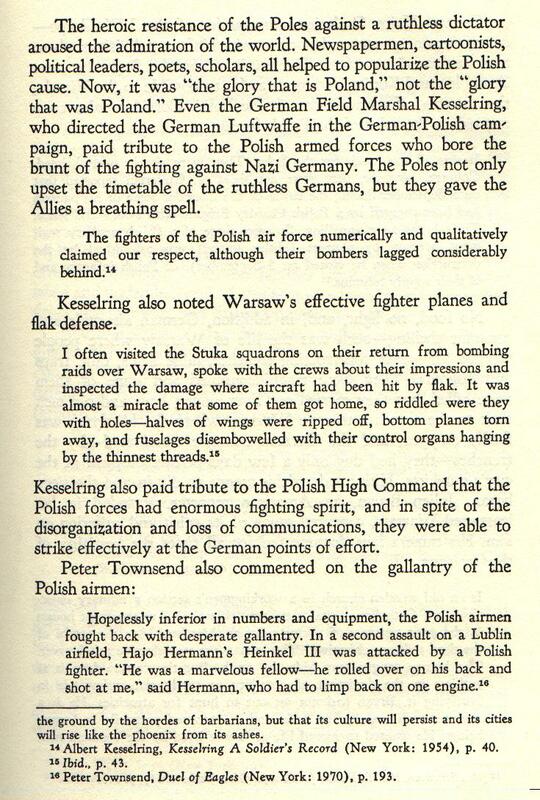 So not only German military knew that Poland stood no chance, some Poles knew it too - and both of them did what they could to prevent it, fighting bravely in 1939. Last edited by Domen123 on Sun Oct 11, 2009 6:01 pm, edited 1 time in total. Interesting. Were their reputations (and careers!) "officially" rehabilitated after they were found out to be correct in their predictions? Were their reputations (and careers!) "officially" rehabilitated after they were found out to be correct in their predictions? Kutrzeba's reputation was (in fact Kutrzeba's reputation didn't need to be rehabilitated, because - contrary to Mossor - he never came into such a conflict with marschall Rydz-Smigly, just like Guderian never went into a serious conflict with Hitler), but his career not as he died on cancer (after long illness) yet in 1947. I called the example of Guderian as comparison to Kutrzeba, because Guderian also tried to convince Hitler and Jodl that his conceptions were much better. For example he predicted the terrible catastroph of German Army Group "A" and Army Group "Centre" in January of 1945, while Hitler and Jodl didn't believe him. In general reputation of "Sanacja", marschall Rydz-Smigly and all of those who ruled in Poland until September of 1939 completely collapsed so automatically reputation of "everybody else" was rehabilitated. Those who came to power after the fall of Poland in 1939 (so London authorities) were enemies of Sanacja. If it comes to colonel Stefan Mossor, he spent entire war in German captivity. He was liberated not before 1945. So during the war his career was not rehabilitated. After the end of the war he became a general of Polish People's Army and he fought against UPA and participated in resettling Ukrainian minority in Eastern Poland. But yet in 1950 he was arrested, being accused for "anti-state conspiracy" and sentenced to life imprisonment. In prison he was tortured. Three years after Stalin's death, in 1956, he was released from prison and rehabilitated. He came back to service in the Polish People's Army but he died quickly, yet in 1957. Certainly history and historians rehabilitated them. But also in France in 1940 there were voices similar to Mossor and Kutrzeba. For example colonel Rivet or De Gaulle. Col. Rivet wrote "The success of the German Blitzkrieg against Poland was not surprising for us but for Poles and for our [French] General Staff". He said similar things about French capabilities. De Gaulle said (of course yet before 10.05.1940): "without radio stations Germans will smash us." Domen123 wrote: But if it comes to the quality of fortifications itself, according to the German study of Polish fortifications titled: "Denkschrift uber die polnische Landesbefestigung", published by OKH in 1940, Polish concrete fortifications were much better (much more resistant to fire of heavy artillery, Anti-Tank artillery and bombs) than Czechoslovakian fortifications. Polish sources are critical too, as quality of Czech bunkers that were taken over with annexation of Zaolzie is concerned. IIRC there were accounts that their walls couldn't withstand 2 direct hits of 105 mm cannon rounds fired from ca. 4 km distance, and even continous AT fire could penetrate them. phylo_roadking wrote: My particular interest is early-war aviation....and the Polish air campaign is very similarly badly served by English sources. It is everso slghtly better off....because at least there are just SO many books dealing with the aircraft at least...but overviews of the campiagn as a whole - very VERY few, and almost NO campaign memoirs translated into English. Paying tribute to the Polish High Command for disorganization and the loss of communications is very accurate - it was largely the credit of Polish High Command. "War operation is coming into being in a similar way like a precious tapestry, because it also consists of three components: keen operational composition, colorful silk tactical yarn, and - at last - gray, thick and solid warp of proper performance, on which the whole beautiful picture is stringed. Let's unpick from the tapestry this gray, strong warp of material war reality, and only colorful cloud of silk will remain. This mist will be dispersed after any gust of combat misfortune, leaving only a feeling of momentary illusion and permanent disappointment." Stefan Mossor, "Sztuka wojenna w warunkach nowoczesnej wojny" ("The art of war in conditions of the modern warfare"), 1938, p. 618. I have been following your postings with interest. In fact I believed Germany had even tougher time than expected during the September campaign against Poland. For example, the Battle of Modlin where Fortress Modlin held against overwhelming odds. I had even saw some pictures of German prisoners taken by the Poles during the September campaign. Perry Biddiscombe in his book The SS Hunter Battalions noted that during the German retreat from Poland, some of refugee columns were actually protected at the rear by Polish 'white' partisans. Perry Biddiscombe in his book The SS Hunter Battalions noted that during the German retreat from Poland, some of Panzermahn:refugee columns were actually protected at the rear by Polish 'white' partisans. If there was a betrayal of Poland ,it came from the French,because the British had nothing to aid Poland:the first TWO divisions of the BEF were arriving in France at the end of september . My particular interest is early-war aviation....and the Polish air campaign is very similarly badly served by English sources. Apart from Cynk from the Polish point of view there are also books of Jerzy Pawlak, but his works are similar to works of Emmerling if it comes to being biased. Very close to this number (over 5,100), but this includes both dead and missing as well as both civilian and military (ethnic Germans serving in Polish army). All figures represent casualties caused by all causes, contrary to the name of this commision ("... fur die ermordeten Volksdeutschen"). According to prof. Karol Pospieszalski, circa 2,000 of these civilian casualties were losses suffered by German sabotage organizations. Doc. Tomasz Chinciński estimates the total strength of German sabotage organizations and various forms of German sabotage activity in Poland in 1939 at circa 20,000 men. Also other casualties, like victims of combats, victims of bombings, etc. are included in these totals. Losses of soldiers of the Polish army represent the number of Germans KIA / MIA in defence of Poland. I suppose that apart from the well-known events (like events in Bydgoszcz), some German civilians also died in Bereza Kartuska, as after the war started circa 3,000 - 4,000 ethnic Germans (those who were recognized as uncertain or dangerous "elements") were imprisoned there, while the camp was only adapted to have 800 prisoners imprisoned at the same time. So the prison was highly overcrowded. Similar things happened to the Japanese minority in the USA after Pearl Harbour. There are some excellent Polish works concerning German sabotage activity in Poland in 1939, I wish they were available in English too. After copying it to Microsoft Word, it results in 23 pages (Arial, font size 9), so it should be hard to translate it. Anyway, the whole bulettin costs only 30 PLN. Tomasz Chincinski largely bases his work on numerous archival documents (many newly-discovered) from Polish, German, Russian, American, British archives. ... so it should be hard to translate it. Shouldn't be hard - of course. Additionally there was a number of different transporters and Zugkraftwagen (Zgkw) not included above. Which means that 70% of German army vehicles were motor vehicles and only 30% were horse-drawn vehicles. Above numbers include all Feldheer vehicles - not only those involved in Polenfeldzug. Approximately 2/3 of these vehicles were involved in Poland - including more than 2/3 of motor vehicles (because all fast divisions were in Poland).